Set on September 12, 2001, less than twenty-four hours after terrorists brought down the World Trade Center, The Mercy Seat introduces us to lovers Ben and Abby. Ben was supposed to have been working in the Twin Towers on that fateful day, but was playing hooky with Abby, his mistress and boss. Suddenly the two see a new possibility for their future that didn�t exist just a day earlier. Will Ben let his family know he�s alive? "...While the 9/11 backdrop provides the opening for the play�s central dilemma, on the flip side it�s an easy shortcut to dramatic heft � invoking a context with ready-made significance rather than building the stakes organically from within, as we find in LaBute�s best work. 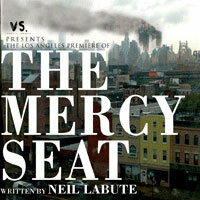 Still, �The Mercy Seat�s� merciless insight into the �ground zero� of selfishness is sobering and compelling." "...Clunie all but steals the show with an artfully nuanced performance that galvanizes Abby's tough exterior with affecting currents of wounded vulnerability and frustrated yearning. Unfortunately, with the exception of exhilarating flourishes provided by Derrick McDaniel's poetic lights, director Ron Klier's staging is so weighted down by Danny Cistone's distractingly overelaborate and hyperrealistic set that the production rarely achieves LaBute's intended metaphoric lift." "...It's an intimate story of two people in love who are desperately trying to salvage their bond amid a torrent of moral dilemmas and personal insecurities. Director Ron Klier guides two fiercely committed actors in a knockout production that elicits profound ruminations on urgent issues." "...The Mercy Seat is an undeniably provocative and engaging look into contemporary values and relationships. Spending a night at the theater with a quarrelling couple may be too realistic for comfort, but this remarkable production by Vs. Theatre Company deserves our attention." "...Although the play�s cascading arguments grow repetitive at times, Johnny Clark (Ben) and Michelle Clunie (Abby) embody these despicably relatable characters with extraordinary conviction. Clark�s Ben is shell-shocked and silent, poised on the couch with a blank-faced stare as he mulls over the life decisions now before him." "...Any Los Angeles premiere of a Neil Labute play is bound to be buzz-worthy, and for one as fine as the one now playing at [Inside] The Ford the buzz is likely to be loud indeed. Trust me. You will be talking about The Mercy Seat long after its striking final tableau fades to black." "...LaBute is lucky to have two excellent actors in Jonny Clark, an actor to watch, and Michelle Clunie, who was in the very frank Queer Like Folk. Each holds his or her own against the other and lets their character gradually reveal themselves. At the curtain call they look like they themselves had been put through the wringer. Both gave powerful unselfish performances. Ron Klier has directed them with a sure eye for detail and lets the characters reveal themselves slowly." "...Halfway through this diatribe, well-directed by Ron Klier, it occurred to me that we could be heading to a murderous bloody finale, but the arguments aren�t heated enough to support that outcome. In fact, the finale is a satisfying and plausible one. But watching these two unlikeable characters squabbling begs the question why is this pair still together?" "...There are funny moments in this play, but they;re not enough to lighten the heaviness of LaBute�s plodding plot. Just as Abbie�s humor is ironic, so is the play�s title. �The Mercy Seat� may signify opportunity for Ben, but it is a merciless and unbroken ninety minutes of overwhelming drama for the viewer."